I was never a fan of vanilla Android devices like Nexus, because it offers baseline features of the newest Android OS without any interface enhancements. Some consumers love it because it is devoid of unnecessary bloatware or functions that could make the device run slower. And since Nexus runs on stock Android OS, the software updates are also faster than the customised OS from other manufacturers. Ironically, some of these customised features actually allow the user to operate the device faster. But as a gadget reviewer, trying out the latest Nexus 7 will let me experience the new Android 4.3 Jelly Bean OS features and set a benchmark on the upcoming software upgrades that will be made available to the rest of the Android phones in time to come. Fortunately, the new Nexus 7 is getting closer to what a “good” tablet should have. It runs on quad-core 1.5GHz Snapdragon S4 Pro with 2GB RAM. Features like front and rear cameras, NFC, stereo speakers at both sides of the tablet in landscape mode, LED indicator, a longer aspect ratio to allow better one-hand grip in portrait mode. There is also built-in Qi wireless charging. Sadly, external memory slot is still not available, and the 5-megapixel rear camera is just good enough for general shots, certainly not the archival quality that you will easily find in the flagship smartphones. Only available on Android tablets, I can create separate logins for multiple users without worrying about them accessing my emails, files and social content. Each profile can have its own wallpaper, home screens, apps list. Switching profiles is also relatively fast (compared to desktop OS), and every time you switch among the profiles, it will resume from where you left off. One drawback is that there is no way to share files across the profiles. The main “admin” profile does not allow you to access all the data from other users, which is a shame. Instead of cramping all info into a single notification dropdown view, Nexus 7 provides 2 separate views, depending on where you drag the notification bar. To the left, you see the app notifications. To the right, you see the shortcut icons. 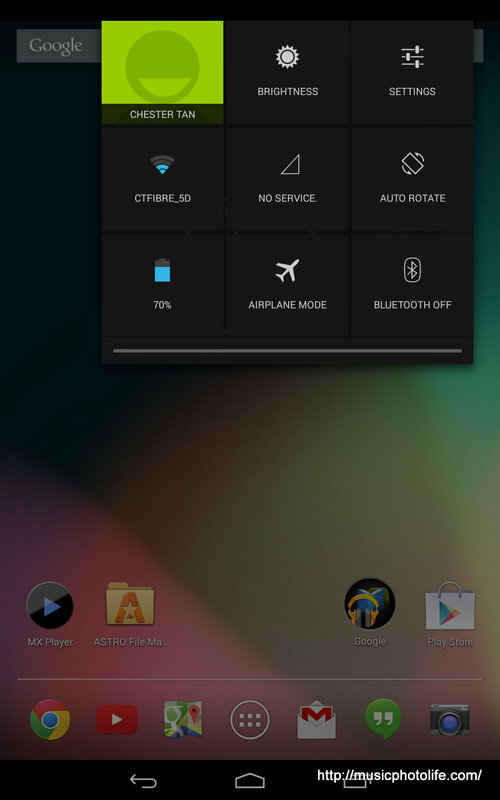 Lockscreen is not just the boring display to unlock your device. Now you can add widget pages to be accessible on lockscreens by sliding left-right. Just be mindful that the information is not sensitive, since anyone can see the widget display even without unlocking the device. 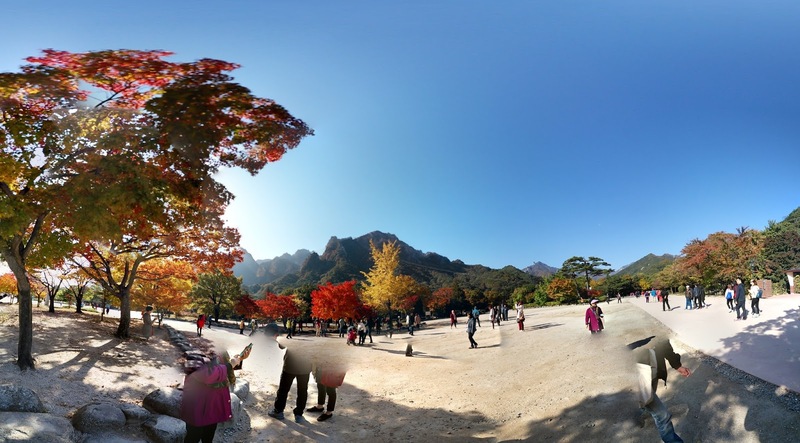 It is a camera feature that helps you capture 360-degree or wide-angle shot. The app comes with on-screen indicators for you to align the camera which then snaps the image automatically. Once you have covered all the shots, the app then stitches the images together. In practice, it is difficult to produce a perfectly stitched image due to moving objects all around you. The app also does not allow you to re-take a particular section. However, if you do have the opportunity to be left all alone in the wilderness, the app does help you snap and stitch in all directions, top to bottom. A feature made available for years, Google finally incorporates it officially as an Android keyboard feature. By sliding your fingers across the keyboard, it can guess the word that you are trying to type. The Nexus 7 is packed with full HD 1920×1080 resolution in a 7-inch display, translating to 323 ppi and smoother text. The display quality is pleasing and does not have that overly high-contrast pop-up look, compared to Samsung or even the ASUS Padfone Infinity. And of course, one of the advantages of owning a Google Nexus device is that you will be one of the first to upgrade your device to the latest Android OS. 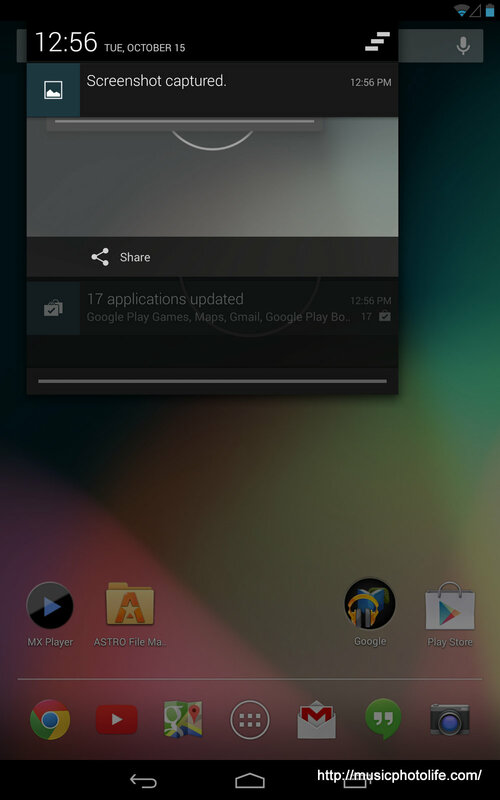 The upcoming Android 4.4 (Kit Kat) will be available over the next few weeks. 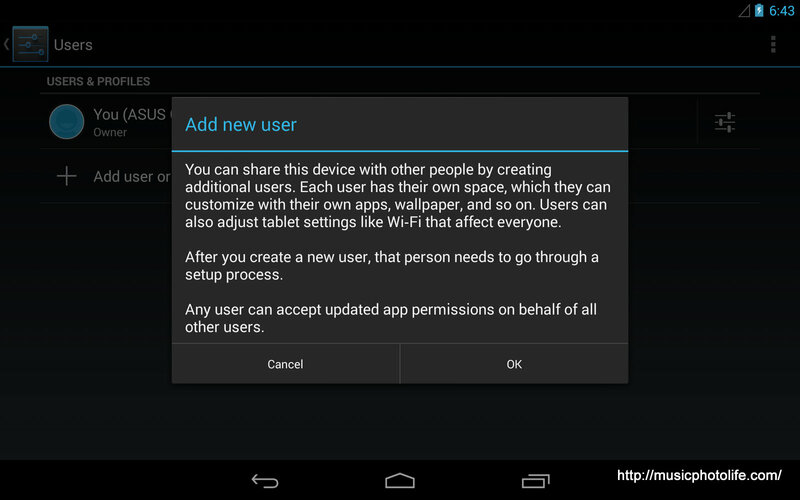 There is a large community of developers who customise the firmware for Nexus devices. If you like to play around with your tablet to make it less restrictive, then getting the Nexus will guarantee your freedom. The Nexus 7 is priced rather attractively, and mostly because it offers vanilla features that do not cost as much to the manufacturer. I would get a Nexus 7 anytime over a China OEM tablet even though the latter is cheaper. I appreciate Google Android’s continual innovation to deliver features that improve the usage experience of our smart devices. 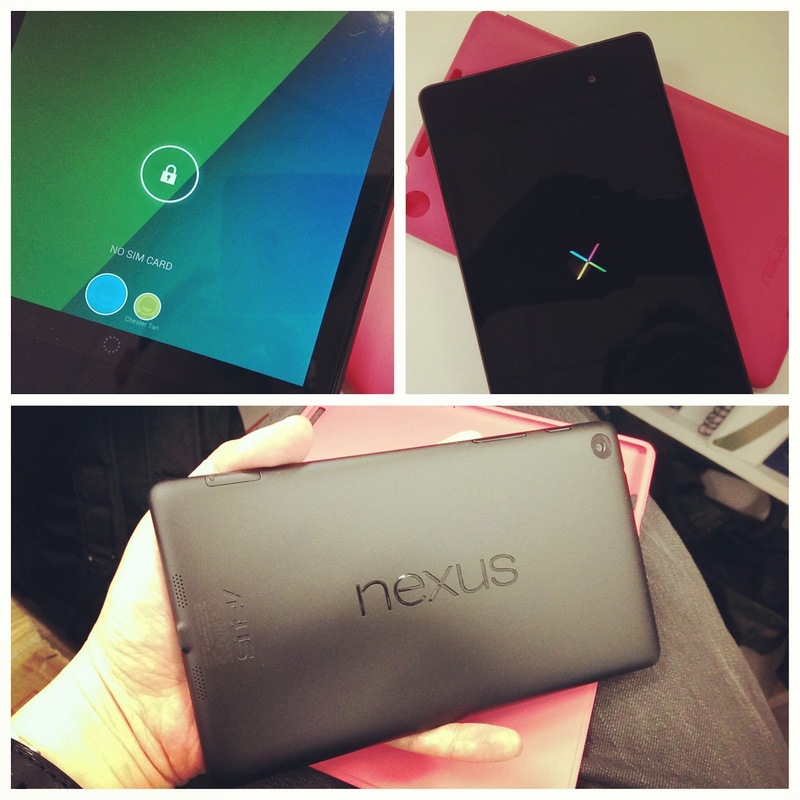 The new Nexus 7 is a premium-styled device endorsed by Google to set the benchmark of 7-inch tablets. If you are undecided about which brands you want to go for, then it would be safe to choose a Nexus. If you know what you need from a tablet (e.g. pen input, water proof, voice-enabled, transformable), then there are many other brands out there, one of which will fit your needs. The new Nexus 7 comes with variants of 16GB Wi-Fi (RRP S$379), 32GB Wi-Fi (S$429) and 32GB 4G LTE (S$529).